Bernard Miller took this photo of NGC 1977, the Running Man Nebula, Nov. 12, 2012 to Feb. 4, 2013 from Rancho Hidalgo, New Mexico. Miller used a TEC-140 (F7) telescope, AP900 GTO mount and a SBIG ST-8300M camera to take this image. 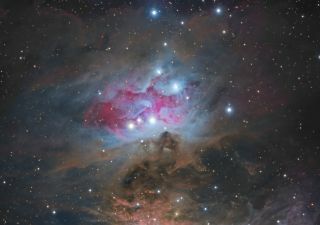 The Running Man Nebula sprints into focus in this beautiful night sky photo. Astrophotographer Bernard Miller captured the image between Nov. 12, 2012 and Feb. 4, 2013, from Rancho Hidalgo, N.M. This reflection nebula, also known as NGC 1977, is located in the constellation of Orion about 1,500 light years from Earth. A light-year is the distance light travels in one year, or about 6 trillion miles (10 trillion kilometers). A reflection nebula doesn't emit any visible light on its own; instead it's illuminated by light from nearby stars. Miller used a TEC-140 (F7) telescope, an AP900 GTO mount and a SBIG ST-8300M camera to take the photos for this image.